Insider tip Westfjords - Start your adventure from holiday home Tvera! Iceland continues to be very popular with visitors from all over the world. While the number of hikers in the highlands is declining (which is good for the sensitive nature), the number of visitors in the easily accessible places continues to rise. The rush is concentrated mainly on the well-known attractions along the south coast and in the Golden Circle. 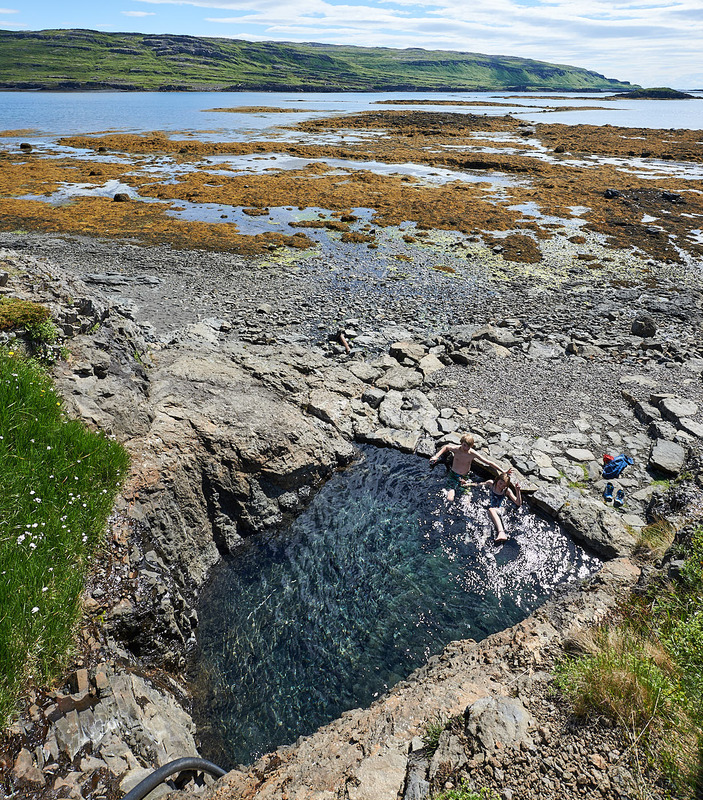 Still little discovered and therefore still a real insider tip are the Westfjords of Iceland. Here the clock turns even slower, the attractions are not as crowded as in the south of Iceland and the buses do not bring new visitors day and night. For a long time, the West Fjords were affected by rural exodus. The conditions for the inhabitants were too rough, especially in winter, and the distances to the next town are still huge. The Westfjords of Iceland belong geologically to the oldest land mass of Iceland. They are characterised by majestic mountains and endless coastlines. Pure nature! On seemingly endless roads along the coast, visitors discover picturesque fishing villages and experience fascinating views. 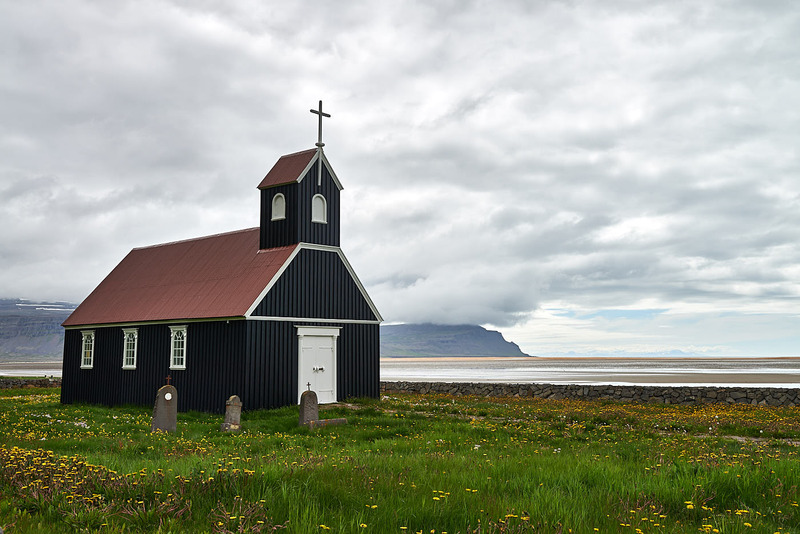 Those who do not travel by plane via the “capital of the west” Ísafjörður, either use the ferry connection from Stykkisholmur via the island Flatey to Brjanslaekur, or travel by car via the approx. 7 km long the bridge across the Gilsfjordur -fjord, and then you are in the Westfjords. A little east of the Brjanslaekur ferry landing stage lies our vacation cottage Tvera, from which the southern part of the Westfjords can be reached quickly. Only a few kilometres away from Tvera the hot spring Hellulaug invites you to a hot bath with a free view of the fjord. 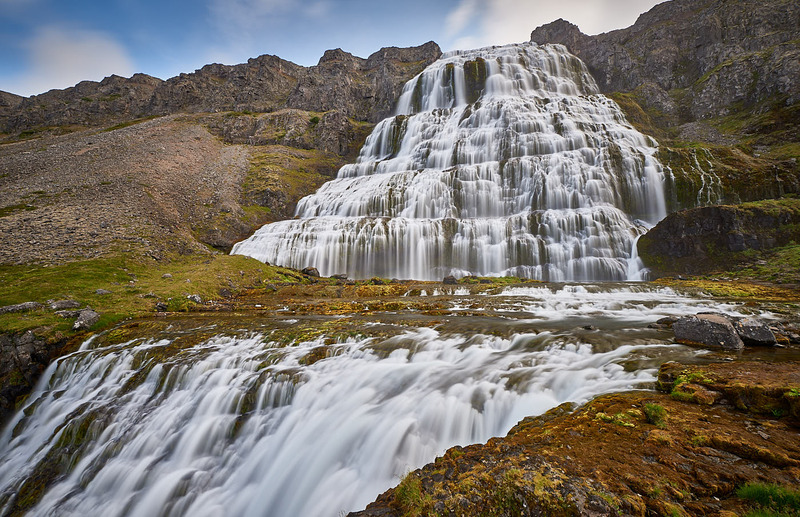 One of the main attractions of the Westfjords is the beautiful Dynjandi waterfall. Only 30 minutes drive from holiday home Tvera you cross a pass and reach the waterfall. Not only the waterfall Dynjandi (which means “the raving one”) is to be admired here, but also numerous smaller waterfalls, which pour themselves below the approx. 100 meters high Dynjandi successively. Another main attraction of the West Fjords is the steep Látrabjarg coast. Látrabjarg is the westernmost point of Europe, apart from some smaller offshore islands. 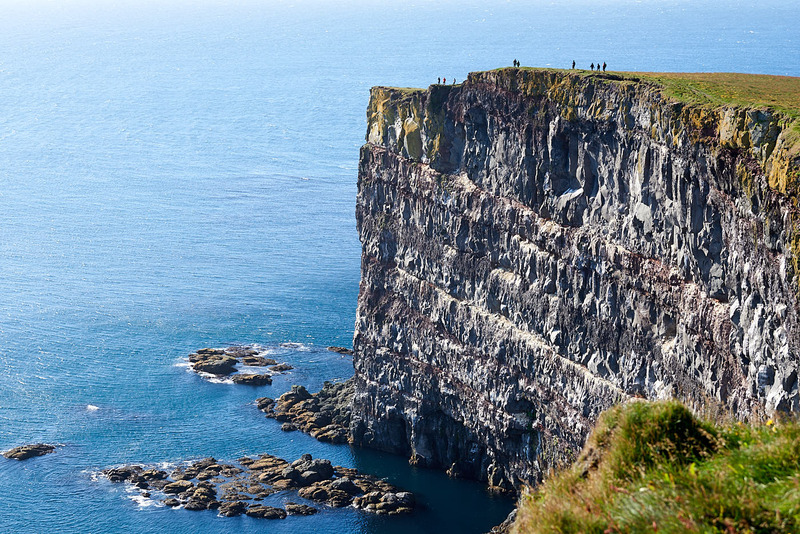 The up to 450 meters high and 14 kilometers long cliff is one of the largest bird cliffs in the world. Millions of seabirds live here, including puffins, (common) guillemots and razorbills. 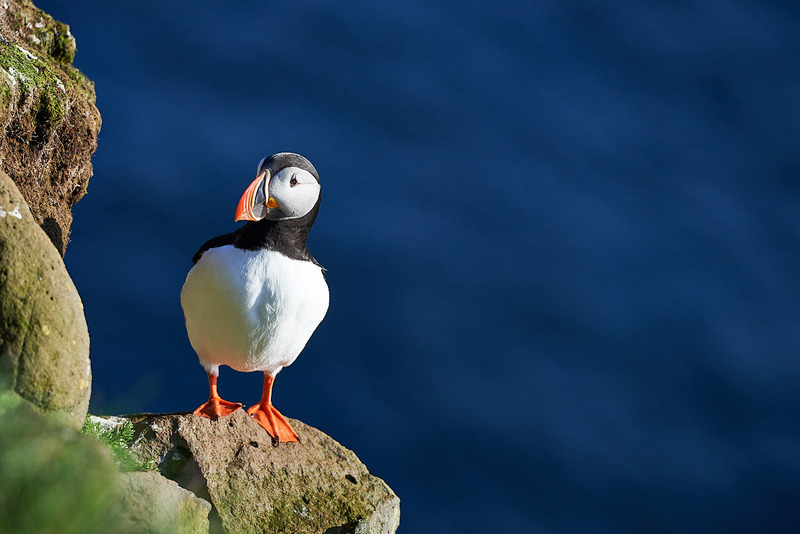 In the summer months, the highly photogenic puffins can be observed from a short distance. On a day trip from our holiday home Tvera in the direction of Látrabjarg, it is worth making a detour to the almost endless sandy beach Rauðisandur. Follow the signs and turn left onto the road. Already at the height of the pass you enjoy a breathtaking view, which is intensified on the other side during the descent over the serpentines. 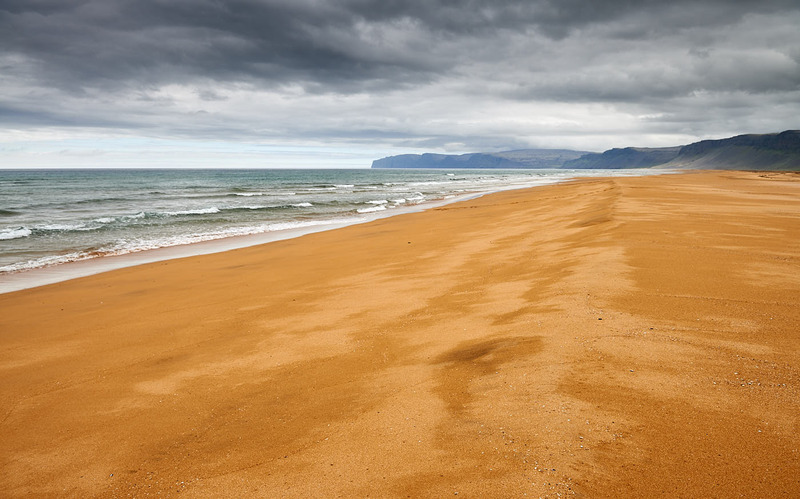 The view of the golden sandy beach is almost endless, inviting you to take long walks. Next to the church, next to the parking lot, there is a cosy café “Kirkjuhvammur” (explore opening hours beforehand!). If you see the name Rauðasandur (instead of Rauðisandur): Both names are used synonymously for the same place. 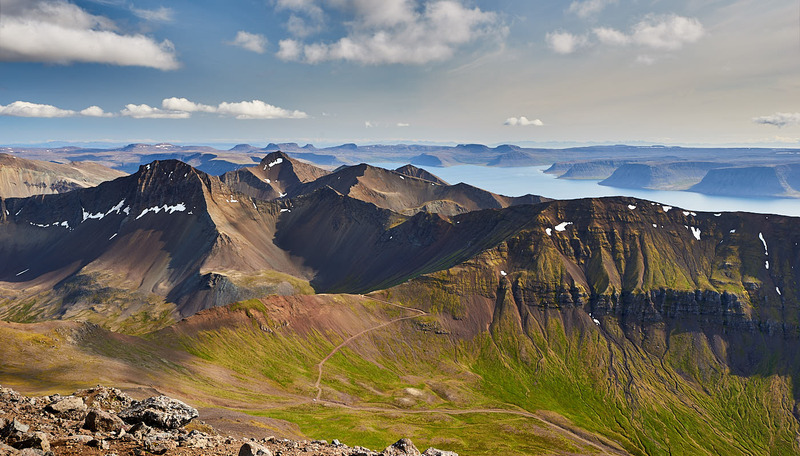 In the Westfjords there are numerous hiking possibilities. Often you won’t see anybody else on your way the whole day. If you want peace and quiet and relaxation, the Westfjords are the place to be. There is a hectic pace elsewhere! You can start a hike to a many million years old carbonated fossil layers, for example, directly from Ferienhaus Tvera. Please contact the responsible ranger beforehand. If you want to do a longer tour, you can start from the coast and hike over the mountains to the next fjord. Spectacular views are guaranteed. From the highest mountain of the Westfjords, the Kaldbakur with 998 meters of height, you enjoy with good weather a marvellous panorama view. Such a beautiful location! I can’t wait to go back.